St Luke’s Church was bombed during world war II and it was decided to leave it deconstructed as a reminder of the devastation of war. The consequence 70 years on is a remarkable lesson in liminal space. The old has died but the new has deliberately been left unbidden. There is a garden blossoming through-out the interior, some installations for music making and visual art exhibitions but the overall effect is untamed, ramshackled freedom. The Urban Strawberry Lunch arts collective seems to take most responsible for curating the space, which they do with conscientious egalitarianism and inclusion. There is a table set up with paints and canvases with an invitation to create your own artwork whilst you sit and soak up the vibe – it feels very much like a prayer station and it indicative of the conflation of art and spirituality in this space. On the day we visited we happened upon an artist pulling down his installation work at the close of his exhibition. 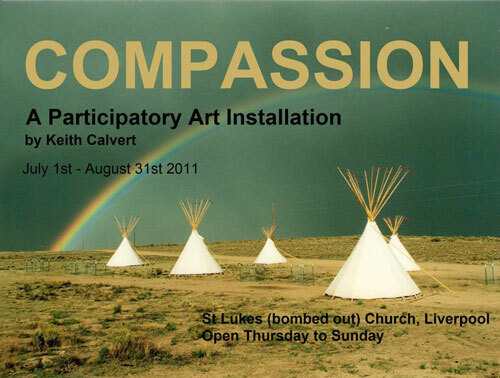 The work was a mandalay teepee set up on the site of the ancient church high alter, inviting people to find the compassion that lives within themselves and commit to expressing that compassion to the world. He described himself as a pagan shaman (with a PhD in Jungian psychology!) and his intention was explicitly spiritual but not at all Christian. Yet the meaning of the work fitted perfectly with a theology of Christ’s compassion made personal to us in the eucharist and in my conversation with the artist we marvelled at how these spiritual connections make themselves felt of their own accord, particularly I would say, in liminal space. What made this liminal space? Well, there are the obvious things like the absense of a roof, floor, windows and doors! But there were several other key ambiguities – was this a church, a gallery, a garden, a performance venue? Is this a safe space or is it dangerous? (We had to sign an ‘enter at own risk into an unstable building site’ waver upon entry!) Is the space beautiful or unkept? Who owns this land, this art work, who tends this garden and pays the bills? All this ambiguity keeps the human inhabitant on their toes – alert to the absence of clarity and the possibilities for questions. There is no definitive form here and certainly no clear answers – the very definition of liminality. I loved it. Hi Chelle, I know this St Luke’s well – used to walk past it on the way to the Diocesan offices, several times a week last year. We’ve been to several events inside. But for us it’s The Sorry Church. Thanks for writing such a interesting blog. I’ve forwarded it to The Bishop of Liverpool, Prof David Jasper at Glasgow Uni and others. Here is my e-mail, keithcalvert@hotmail.co.uk, if you wish I could forward you my theory behind the installation and I’d like to hear more about your MA studies. Hope your well and enjoyed your trip. I would love to read what you’ve written about the Compassion exhibition and will pass it on to the others. Bombed out Church was a highlight of the tour for many of us! All the best for the next installation.